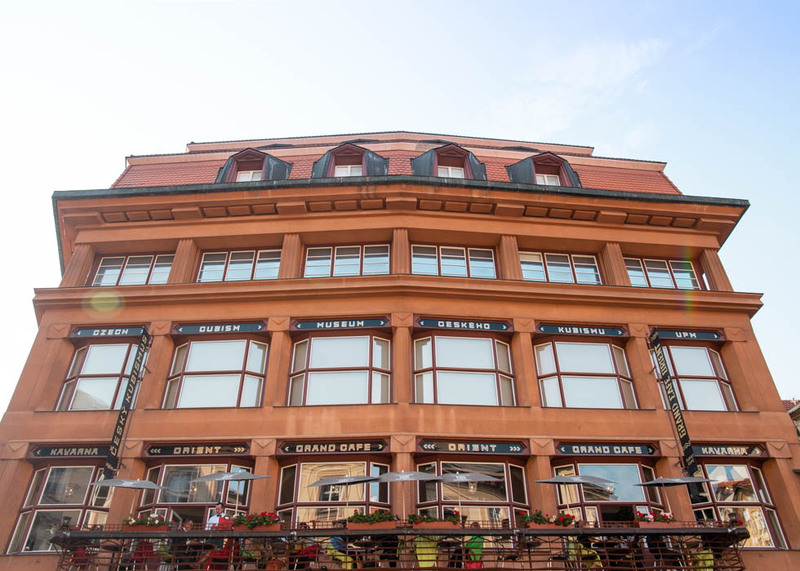 Grand Cafe Orient was built in 1912, by Josef Gočár, who was a Czech painter in the Cubist style impressed by Pablo Picasso. 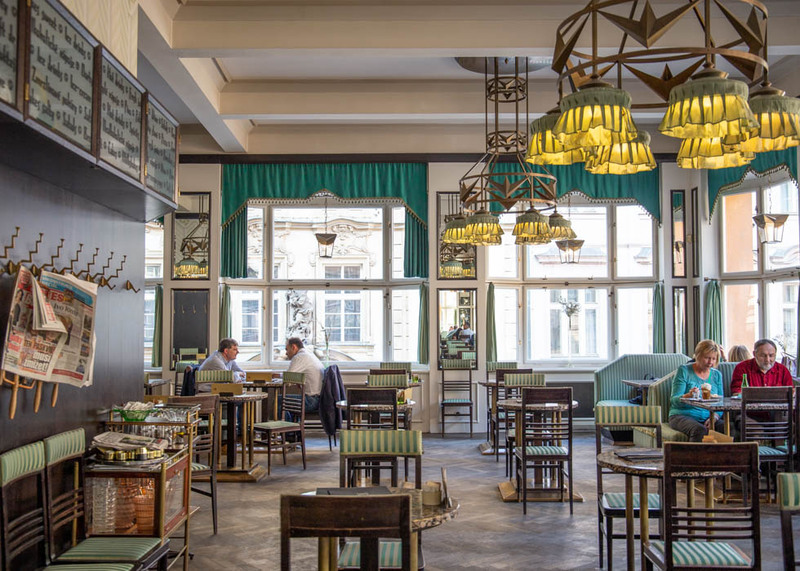 In Prague, most of the buildings are colorful with beautiful and unique style of architecture, but Grand Cafe Orient is absolutely outstanding among them. Cubisum stemmed from cube, and it is to look at stuffs from different angles, ignoring original perspectives. Cubism used be a fashion in Prague in 1900s. When you look at the facade of Grand Orient Cafe, you will notice that the central axis is popping up more. The interior is so modern and elegant that you would not believe that it was built in 1900s. Not only the building, but also furniture, potteries, and glasses also have cubisum style. The color and patterns on sofas and chairs also adds antique atmosphere. One side of the cafe is with big windows, and it makes you feel like you are in the movie when the sunshine comes through them. Terrace seats are perfect especially on a sunny day. 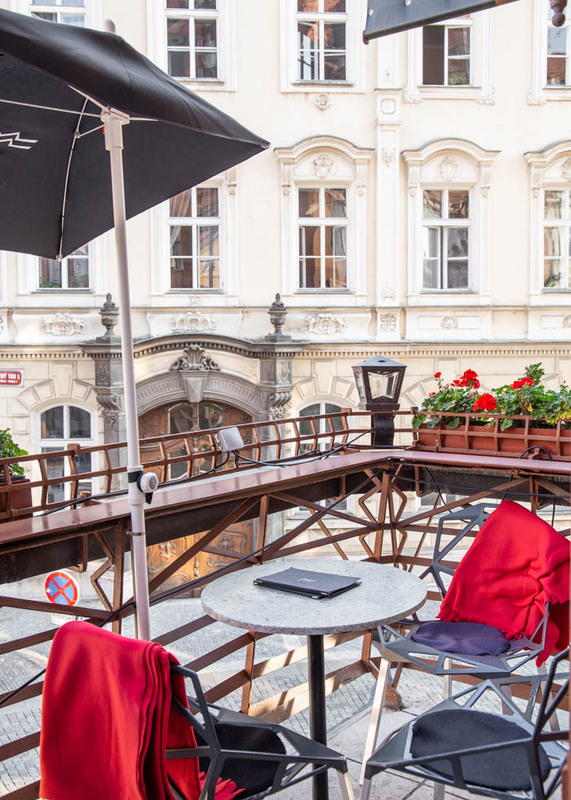 You can look down the beautiful streets of Prague while enjoying a meal or coffee. There are blankets prepared for chilly days. 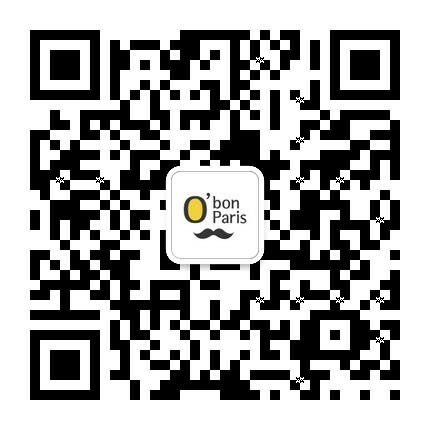 When you visit here for breakfast or brunch, you can order sandwiches or crepes or you can simply enjoy desserts, coffees, or wine. There are some special coffee menus with alcohols in coffee, so if you want something more unique, that is the one to try. 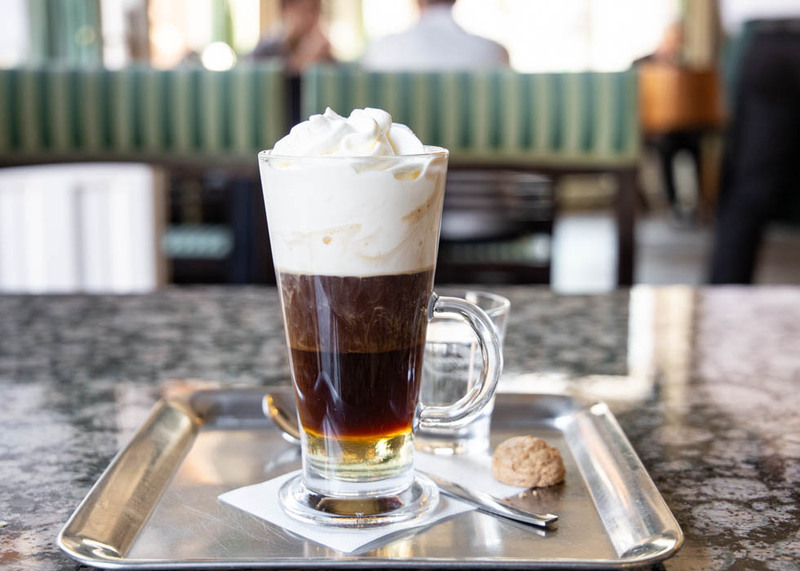 Coffee Vanille is an espresso with vanilla syrup and whipped cream. The bittersweet taste of espresso and sweet vanilla syrup make such a perfect harmony while whipped cream melts into them just like milk. 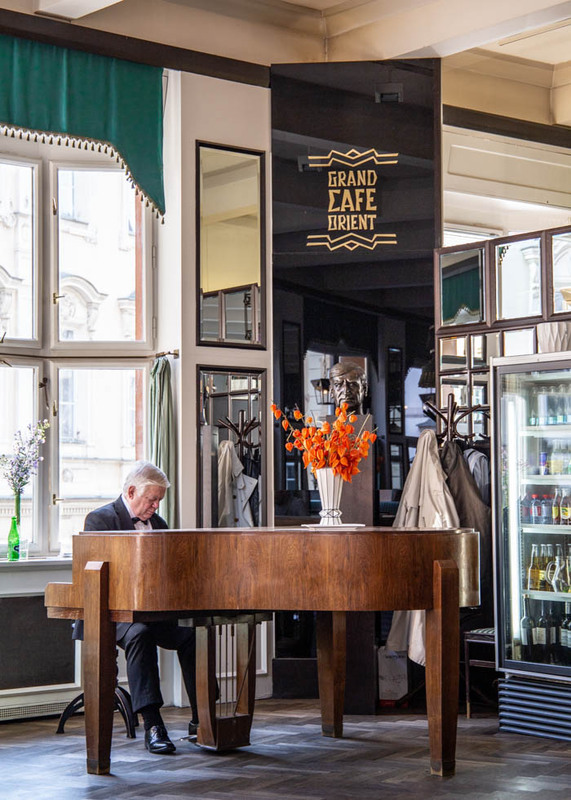 The highlight of Grand Cafe Orient might be the live piano music. At a corner of this cafe, there is a huge piano, and fortunately there was an amazing live piano music session when we visited. 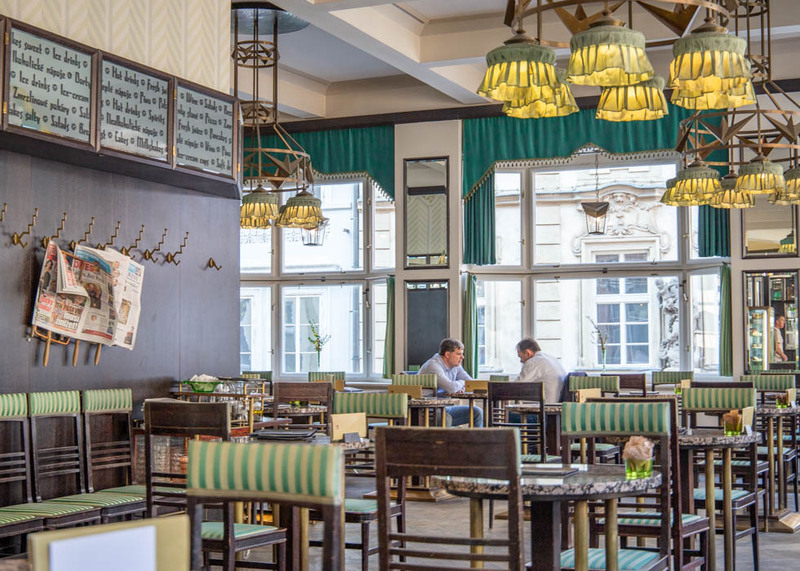 The atmosphere of cafe is already like a movie, and with live piano music, the afternoon in Prague could not be happier and more romantic than this. You might encounter the most happiest coffee time at Grand Cafe Orient. If you want to have a breakfast surrounded by this elegant and antique atmosphere, visit here in the morning to have a croissant, sandwich or omelette. If you are visiting in the afternoon after a meal, a cup of coffee with a piece of sweet cake will be more than enough to make you happier.